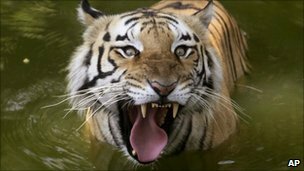 Villagers in southern Bangladesh have beaten to death a Royal Bengal Tiger, a critically endangered species, after it strayed near their homes. 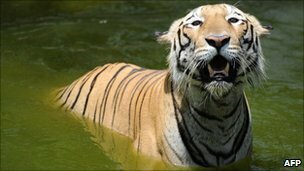 It was the second tiger killed near the Sunderbans mangrove forests this year. An estimated 440 tigers live in the forests, which stretch between Bangladesh and India. As a rare species, tigers are protected by law in Bangladesh. However, the number of attacks involving the animals has sharply increased. Forty-one incidents were reported in Bangladesh in the first six months of 2010, compared with 58 in the whole of 2009. So far this year 26 people have been killed by tigers, officials say. Villagers are sometimes attacked by tigers when they go into the Sunderbans forests to fish or collect honey. Experts warn that such encounters will increase as humans and tigers compete for the same natural resources. 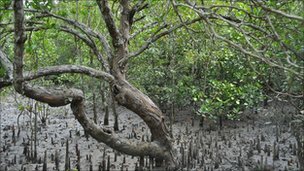 For generations poor fishermen and villagers around Bangladesh's Sundarbans, the largest mangrove forests in the world, have been collecting wild honey from April to June every year. The annual honey gathering season brings lots of expectations in the south-west of the country, as it provides people with much needed extra income. On average, the fishermen earn around $70 to $80 (£42 to £49) each during the season. Honey gathering may sound like a normal rural occupation but here it is perhaps the most dangerous job in the world. As the fishermen move about in search of beehives in the wild, they run the risk of meeting a deadly foe - the Royal Bengal tiger. "During this period the biggest danger comes from the tigers. They are always on the prowl and they can kill us instantly," says Abdus Salam, an experienced honey gatherer from Burigoalini village, in the district of Satkhira in western Sundarbans. 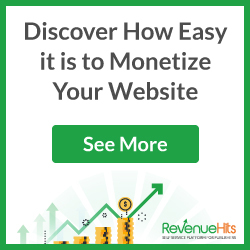 "Then there are venomous snakes inside the forests. In these muddy waters, crocodiles lie in waiting," he adds. Mr Salam says that they also have to deal with the problem of pirates. "If we don't pay them they will kill us mercilessly. This job is full of risks," he says. Tiger attacks happen throughout the year but the number of incidents goes up during the honey gathering season. At least 80 people are killed by the tigers every year in the Sundarbans. The fishermen normally go from island to island for about three weeks in their creaky boats collecting honey, made by some of the largest and most aggressive bees in the world. 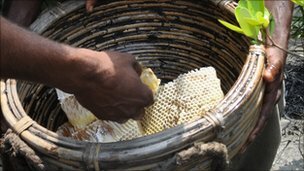 The honey gatherers travel through muddy saltwater rivers, creeks and narrow channels that criss-cross the Sundarbans forests. We went with the honey gatherers for a day by boat, deep into the western Sundarbans forests, in search of wild beehives. Our first stop was to practice an ancient custom. The Sundarbans fishermen pray to the forest Goddess Bonbibi, who they believe will protect them from tigers and other dangers. These fishermen, Hindus and Muslims, have been praying to Bonbibi for generations. Some of the team members also used the stop to collect leaves and twigs which can be used to prepare a smoke-emitting torch to scatter away the bees. As our boat moved deeper inside the mangrove forests the eldest member of the group Amzad Mollah urged caution. "A 12 year-old-boy was killed by a tiger just here last December," he says. "On my right side near the tree, another honey gatherer was mauled to death by a tiger in February. A young fisherman from my village was killed by the animal in the same area last month." Deep inside the dense jungle, one of the fishermen soon spotted a huge beehive on a tree branch. It was at least four-feet wide, with tens of thousands of giant wild bees nesting. "Cover your face with this cloth otherwise the bees will attack you," warned Mr Mollah as he passed one of his cotton towels, or Gamcha, to me. All the honey hunters also had their faces covered. As we approached the beehive cautiously, the honey gatherers lit up torches made up of leaves and twigs to create smoke. The smoke forced the bees to fly away but a few of them attacked those who weren't holding a torch. The honey hunters did not mind the sting. Soon one of them climbed up the tree and started cutting the honey combs. They gathered a few pieces in a bamboo basket and we could see the golden syrup flowing through the comb. While some were busy gathering honey, others were on guard and were bursting crackers and blowing buffalo horns to scare away any tigers in the area. The fishermen were also in a hurry as they wanted to leave the place as quickly as possible. As we were returning, the fishermen started singing folk songs praising the Sundarbans for giving them livelihood. Almost everyone in the group had a story to tell about tiger attacks. A few of them showed deep scars on their heads and shoulders and others said some of their relatives were not as lucky as them to survive the attacks with injuries. 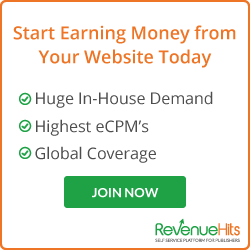 So why do these men take such risks to earn very little extra money? "If we can get any other work we will happily do that," says Asgar Ali Sheikh, a senior member of the group. "If a tiger kills anyone of us, we cannot be afraid and stay at home. If we don't come here, we cannot feed our parents and children. It's our life." With no other jobs on offer, it seems these fishermen from the Sundarbans have little option than to carry on with one of the most dangerous professions in the world. The BBC's Anbarasan Ethirajan travels with a group of fishermen into the Sundarbans mangrove forests to witness their risky trade.